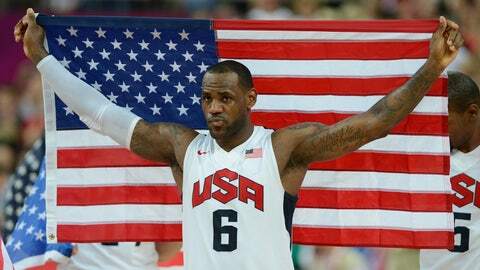 Miami's LeBron James won gold with Team USA at the 2008 and 2012 Summer Olympics. With LeBron James sticking around and some of the NBA’s best players joining him, the U.S. basketball team could be better than ever. "The roster itself is the strongest roster we’ve ever had," USA Basketball chairman Jerry Colangelo said. Even without Kobe Bryant, who had said the 2012 London Olympics was his last international competition, it’s a formidable group. James and 10 others from the 2012 U.S. Olympic team are remaining in the national team pool, joined by a group of newcomers hoping for their first chance at gold. USA Basketball selected 28 players Thursday to choose from for the World Cup of Basketball this summer in Spain and the 2016 Rio Olympics. Carmelo Anthony was also chosen, giving him and James a chance to play in a fourth Olympics and win a third gold medal. They won’t play this summer, but might still put on the red, white and blue one more time down the road. "We really do want to give some of the younger players an opportunity in Spain this summer, but they want to remain there and stay in the mix for being on our roster in Rio," Colangelo said on a conference call. Also selected from the 2012 gold medalists were: Kevin Durant, Chris Paul, Kevin Love, Deron Williams, James Harden, Russell Westbrook, Anthony Davis, Tyson Chandler and Andre Iguodala. Duke coach Mike Krzyzewski is back to lead the Americans, as he has done since 2005. The other players picked were: Chicago’s Derrick Rose, Houston’s Dwight Howard, the Clippers’ Blake Griffin, Indiana’s Paul George; Stephen Curry, David Lee and Klay Thompson of Golden State; LaMarcus Aldridge and Damian Lillard of Portland; Sacramento’s DeMarcus Cousins, Kyrie Irving of Cleveland; San Antonio’s Kawhi Leonard; Washington’s Bradley Beal; Atlanta’s Kyle Korver; Detroit’s Andre Drummond; Denver’s Kenneth Faried; and Utah’s Gordon Hayward. It’s an experienced, star-filled group — it includes the NBA’s top 10 scorers — and the Americans stressed it will be "fluid," meaning more players could be added over the next three years. And unlike recent U.S. teams, it’s big. The Americans have been undersized up front, but have plenty of post players to choose from with Howard, Chandler, Cousins, Davis and Aldridge. "Those are more big guys than we’ve had before," said Krzyzewski, noting he had James and Anthony on the floor as his two big men late in the 2012 gold-medal game. "We do have a few more options now." Half of the 28 players have already won gold in either the Olympics or world basketball championships, which was renamed for this year’s event. James, Anthony, Paul and Williams all have played for the last two Olympic gold-medal winners. Howard missed his chance to join them when he had to pull out of the 2012 London Games because of injury. So did Rose and Griffin — the latter after he had made the final 12-man roster. Durant and Love were the first to announce their return last summer and are expected to play in Spain. They, along with Iguodala, Westbrook and Chandler, won gold in both 2010 and 2012. The Americans will have to trim the roster to 12 before heading to Spain. If they defend their world title, they will automatically clinch a spot for Rio. If not, they would have to play in an Olympic qualifying tournament in 2015. As in 2010, when they won the worlds for the first time since 1994, the Americans will likely feature a younger roster. But it’s a deep one, with the potential to bring players such as Aldridge, George and Cousins, who have been among the NBA’s best this season. Then James, who began his Olympic career with a bronze in 2004, could make his way back. He and Anthony have already tied David Robinson for the most among U.S. players with their three Olympic appearances. "LeBron has an incredible opportunity to do it a fourth time and the mere fact that his name is on the roster indicates his desire and interest in continuing to have that opportunity in front of him," Colangelo said. Krzyzewski saw James on Wednesday when Duke played at Miami, and said the NBA’s MVP was excited to remain involved. "For him to do it a fourth time would be just another star or asterisk next to his name and his career, and it appears that’s exactly what he wants to try," Colangelo said.